SuperTrace is a fully chelated, multi-mineral liquid fertilizer with USDA organic compliant fulvic acid that reduces, corrects and prevents mineral deficiencies in plants. This 6% iron formula is for use on turf as a spray or fertigation and as a root fertilizer for trees and shrubs. It is fully chelated allowing maximum nutrient access by the plant. No harsh chemicals are used in the formulation of this product. Find the SuperTrace 6% label for WA and ID here. Oregon label here. MSDS here. 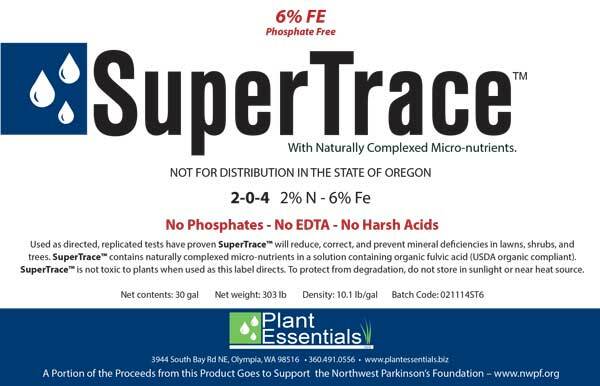 There are no phosphates in SuperTrace for several reasons. First, there is ample phosphorus in most Pacific Northwest soils. Secondly, mobile phosphates present an environmental concern in water. EDTA is a chemical used to sequester metals (chelate) and is widely used in many products today. Besides many fertilizers, EDTA is found in detergents, cosmetics, home cleaning products and a host of other common compounds. It is very effective, perhaps too effective in the eyes of some scientists. 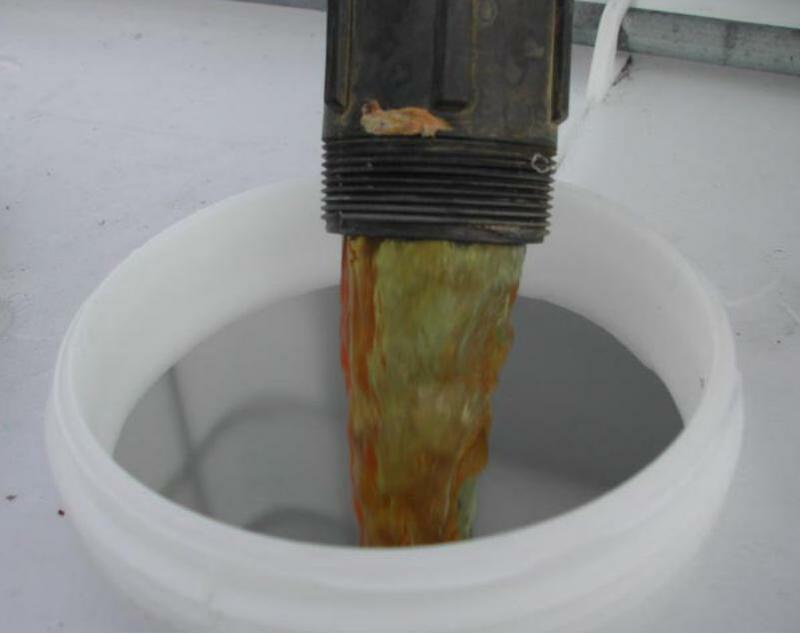 SuperTrace is fully chelated with an organic acid that degrades rapidly in soil and presents no environmental concerns. The successful utilization of fertilizer by plants is directly related to the availability of nutrients in the soil and the mechanism of uptake by the plant. A healthy micro-biological population in the soil is the key to nutrient transport by living plants. SuperTrace and SoilSeeds assist by providing chelated micro-nutrients and by re-establishing a healthy micro-biological community in the soil. In fertile, micro-biologically active substrates, plants are healthier and more easily defend themselves against pests. The uptake of mineral fertilizer is enhanced and the negative effects of inappropriate fertilization or pesticide use are reversed. SuperTrace is a liquid bio-technological product, containing fulvic acid derived from ancient vegetative material mined from the earth. After extraction, it is blended with essential micro-elements and fully chelated. The gentle, meticulous production process utilizes no harsh acids in the extraction process allowing the re-formulation of the raw material into smaller molecules of high nutritional value that can be easily absorbed by plants and micro-organisms. Fulvic acid is a most valuable input in biological agriculture. It can provide a multitude of benefits for to both soil and plant. Fulvic acids (FAs) are the most effective carbon containing chelating compounds known. It is a powerful organic electrolyte. It enhances cell division and elongation. Root growth is magnified with obvious benefits. As a foliar spray, fulvic acid increases the plant’s oxygen uptake capacity with an associated increase in chlorophyll production and an increase in the permeability of plant membranes, improving the uptake of nutrients. It has a unique capacity to dissolve minerals and trace elements. This feature has tremendous import for fast-tracking the plant availability of rock minerals, i.e., rock phosphate and lime. Can interact with sunlight to enhance photosynthesis. This can be particularly valuable during prolonged cloudy periods. Can absorb a part of the harmful UV radiation. This property is also used to delay the decomposition of UV unstable active substances such as Pyrethrum. Fulvic acid is a potent, natural chelating agent, slowing oxidation and converting metallic elements into readily absorbable, bio-available nutrition with very small molecular size allowing fulvic-chelated minerals rapid entry through plant cells. Fulvic acid can detoxify pollutants in the soil. They absorb toxins (reducing soil-life damage) and catalyze their rapid breakdown. Fulvic acid dissolves silica and magnifies the many benefits of this element. Fulvic acid is responsible for an increase in stomata opening and transpiration and assists plant respiration as well as improving the respiration of beneficial micro-organisms. Fulvic acid directly influences numerous enzymatic processes and stimulates the plant’s immune system. There are other quality multi-mineral products available today, but most of them carry heavy price tags and are not widely used because of that. We have priced this product so that it gets wide use and the end user will benefit from that decision. Give us a call today for the number of a distributor close to you.